The etymology is from the Greek words hiero – sacred and glyph – carving. The hieroglyphic script of the Egyptians held an enormous fascination for the humanists. To many of them, the Egyptian language was thought to be the original Adamic language from the time before the fall of man, an idea that was fostered by the remark in Genesis that Adam gave all creatures their name; if this were the case, then Adam must have spoken the first language. The project of recreating such a language was an obsession which the Renaissance humanists and their successors refused to abandon. 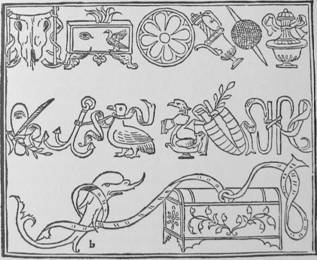 The idea was expounded by Leon Battista Alberti in his De Architectura of 1452 where he proposed that hieroglyphs were the lost universal language. Francis Bacon in the 17th century suggested that the universal language was to be found in ‘real characters’, characters or signs which like hieroglyphics were more than just the concepts which they expressed, they were in some sense the concepts themselves. Another great work on hieroglyphs from the Renaissance was the treatise by Pierio Valeriano also called Hieroglyphica which was published in 1556 but had been written earlier probably before 1527, the year in which Rome had been sacked. It was formally intended as a commentary on and enlargement of the Horapollo but Valeriano extended his commentary to cover other ancient symbols. As he says in the title of the 1567 edition ‘to speak hieroglyphically is nothing else but to discern the true nature things divine and human’.